After such a long day and late night, I woke at noon and checked out of the hotel. I complained about the lack of air conditioning for such a high class expensive hotel and he apologized and took $50 off the bill. 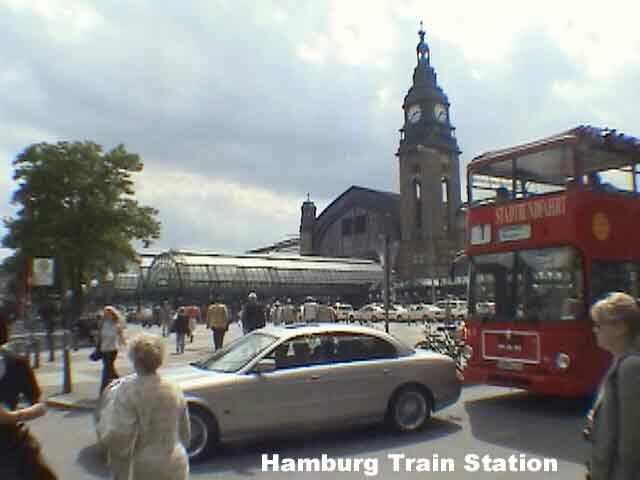 We bought a phone top up card for Marcia’s German chip and then went for a walk through the streets of Hamburg. Marcia needed lunch so we stopped at Café Capri and she had Wienerschnitzle and I had two cappuccinos. We finally got organized and left Hamburg at 4:15 PM for the drive north to Denmark. I drove the first 148 miles through Germany and for the first time in my life I was doing 125 mph for a few minutes. But then, after a couple of hours the autobahn came to a complete stop and then crept along at about 25 mph. After a half hour of this, I pulled off an exit and hoped the GPS would find an alternate route past whatever was the holdup ahead. Well, the alternate route was not a bit faster; the traffic everywhere was all backed up through the small towns. We pulled off in a little town called Bad Bramstedt and filled the gas tank and got some snacks. 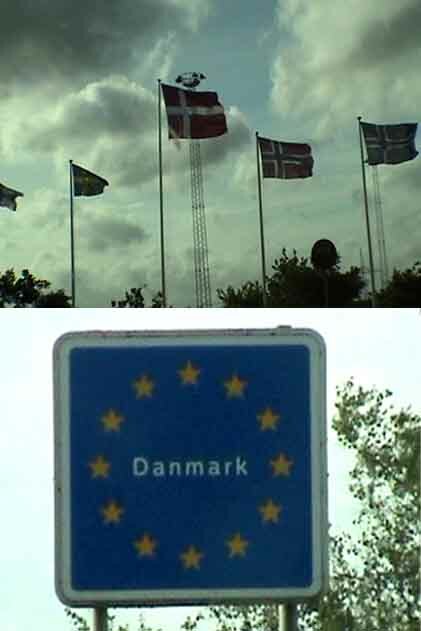 We finally crossed the Danish border at 6:30 PM without fanfare except that the minute we crossed, Marcia’s German phone chip no longer worked. 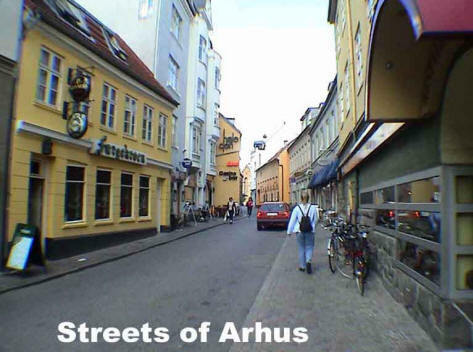 Instead of heading northwest toward Copenhagen (Kobenhavn,) we decided to go straight north up Jutland to Århus (Aarhus) [Ooer-hoose.] At 7:30, Marcia finished the remaining 70 miles into the second largest city in Denmark, arriving at 8:30. 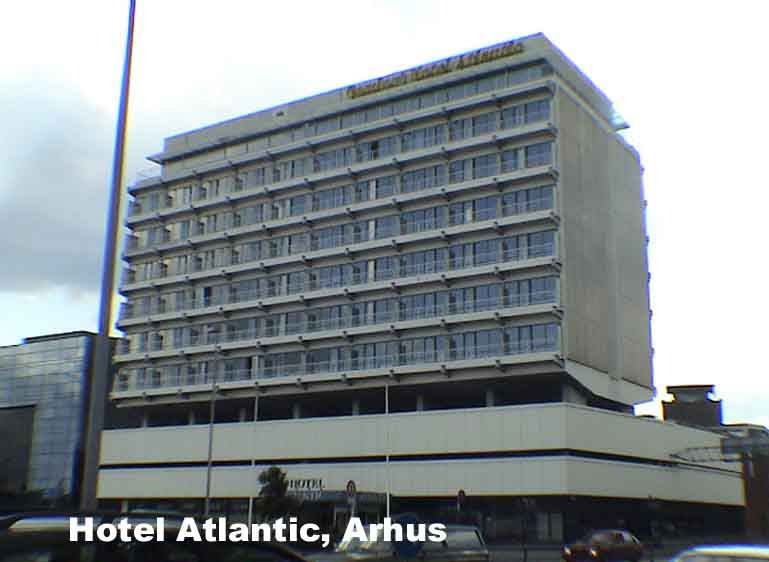 We checked into the Atlantic Hotel (below) [Euroaplads street, +45-] overlooking the harbor. I changed quickly and did my run exploring the town. 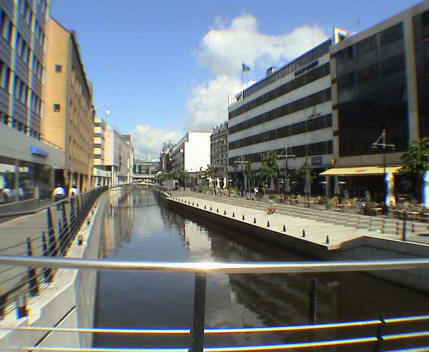 I went up Solgade (the word for street is either gade, gate or gat) and then discovered the Åboulevarden (below left) which runs along a canal and is lined with cafes, bars and restaurants. By this time the places were loaded with people sitting outside having their drinks and many seemed to be eating nachos with cheese poured over them. I also went by several of the restaurants listed in the guidebook and decided where we would go for dinner. I got back to the hotel, changed and Marcia and I headed back to the Åboulevarden and nested in front of the Cross Café for a beer & wine. 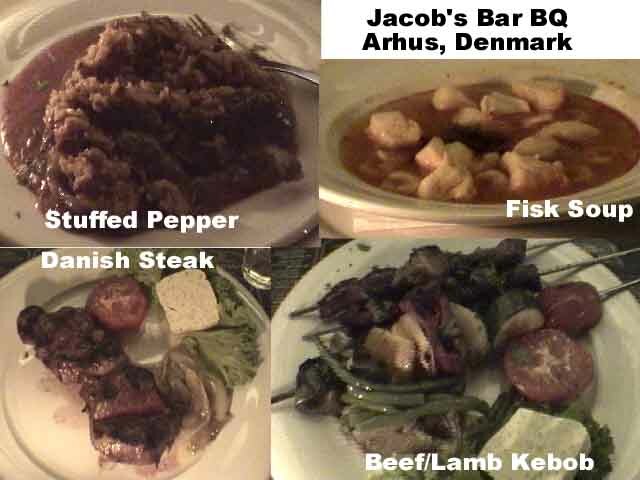 We then walked a couple of blocks to Jacob’s Bar BQ [Vestergade 3, +45-] and were led up to the 2nd floor. The place was wonderful and very busy. It is interesting that everyone here immediately speaks English with you and with very little accent at all. The Danish people so far seem very friendly and nice. For appetizers, I had stuffed pepper (something my Hungarian grandmother and my mother often made) and Marcia had creamy fish (fisk) soup. For an entree she had lamb/beef kebob with fries and I had a steak with baked potato. We washed it down with a Promessa Italian vino rosso. The whole thing came to $100 which I guess isn’t bad since the food was particularly fantastic. I would come here again. A wonderful evening as our 1st day in Scandinavia. We walked slowly back to the hotel even though it was getting very chilly and got to bed at a reasonable 12:30 AM. Woke at 8:30 and 9:30 but finally got going at 11:30 AM. Two things to deal with today: phones and money. After much discussion and thinking it over, it only makes sense to just go ahead a purchase a phone chip for both our phones in each of the 4 countries. Yesterday I went by an Orange store (same company Kristin got her phone in London which is the one Marcia is using) and we headed back there to buy two chips. Simon Shou was very nice and we got our new Danish phone numbers but when I wanted to buy top up cards to add money to the phones as we went along, he told me he had 19 cards each worth Kr250 ($40) and he would sell them to us privately after hours for Kr 200 ($32) apiece. He now had his own Danish phone and didn’t need them anymore. I told him I would think about it and call him later to meet. Now about their currency. Three of the countries we are visiting do not use the Euro but instead they all call their money Kroners (or Crowns), each with a different exchange rate. The Danish Kroner is worth 16 cents or 6.3 Kr per $1. The fairest exchange rate is given at Forex Exchange offices which are everywhere except in Norway. They charge a Kr20 fee for any amount of money changed whether it be $10 or $10,000. With Danish Kroner in hand and our two telephones we were now in business. I had a cappuccino and Marcia had lunch across the street at Sigfred Kaffebar [, +45-.] The girl there was very helpful with the phonebook because I was trying to find the number of Dr. Thomas Olsen, who I had remembered lived in Århus. I called the number and he answered the phone. We made plans to meet for dinner later. Tom is one of the few ophthalmologists in the world interested in IOL power calculation and he has even written some formulas. We only see each other at meetings and to miss seeing him while here in his city would be a shame. Besides, I want to ask him to write a chapter for my book I am planning. 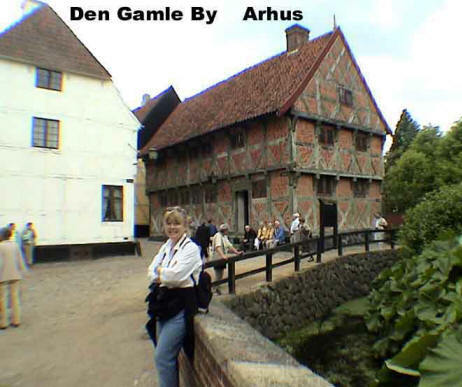 The major tourist attraction to see here is Den Gamle By, which means “the old town.” It is a collection of restored old buildings from all over Denmark. We walked there and spent 2.5 hours touring through all the ancient buildings. It was a very charming and enjoyable experience. 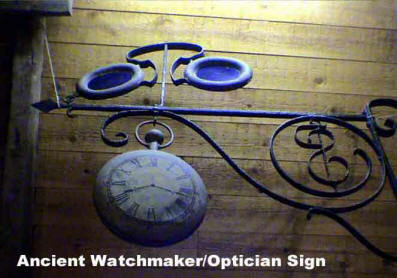 I saw an ancient sign (above right) for an oculist/watchmaker in one of the attics. We walked back to the main pedestrian shopping street and I found a nice light jacket so I could alternate from this blue one I am wearing out. At 6 PM, I repeated my run through the city streets and while I was gone, Marcia met with Simon and bought the phone cards from him. On my run I saw their controversial city hall architecture and several other buildings of note. Tom picked us up at the hotel at 7 PM, and drove us to Marselisborg Havnevej, a new harbor facility packed with boats in the marina. He took us to the Seafood Restaurant [, +45-] with a nice view but the sun was beating down on me (but not them) through the window and it was hot. Tom and I each had a glass of the local beer here called Ceres and we got a bottle of wine. 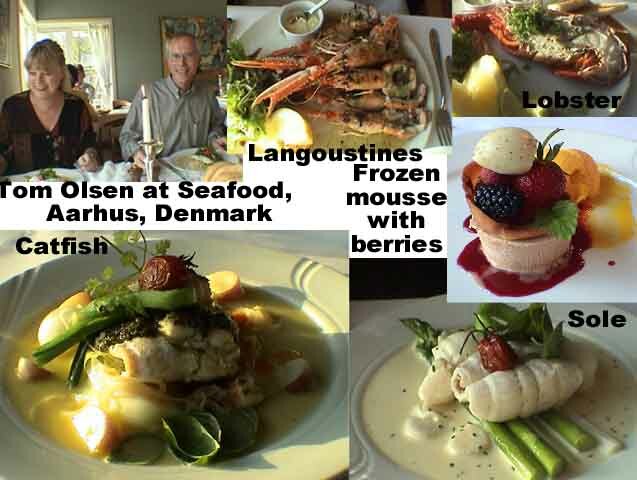 Marcia had Norwegian lobsters (ala langoustines) and I had a cold half lobster (ala Maine) as appetizers and for dinner Tom & I had Sole and Marcia had Catfish. The little tiny boiled potatoes that came with it were so unusually tasty I was eating all of mine and Marcia’s too – I couldn’t stop eating them. I told Tom that the potatoes here were incredible. 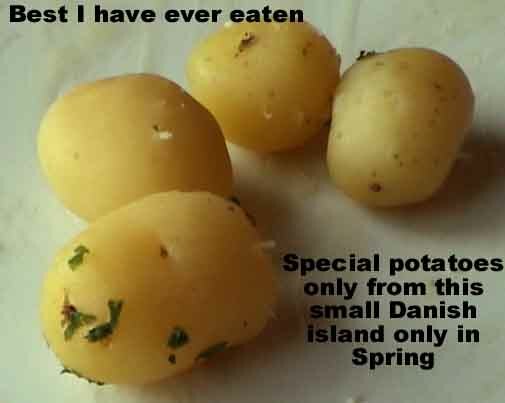 He checked with the waitress and discovered that they were these rare fantastic potatoes that grow only on this one Danish island called Samsø and are never exported. They are only available in the Spring and go to only selected restaurants. I have never eaten potatoes that tasted this good. Samsø potatoes; what a rare treat. For dessert, I had frozen mousse with berries and she had crème brulee. It was all very good and I enjoyed our conversation and Tom agreed to write a chapter. We also agreed to work on new formulas by my contacts with manufacturers. He drove us back to the hotel at 11:00 and Marcia was exhausted and went to bed. I walked back over to Åboulevarden and found the first bar called Globen Flakket [, +47-] (they were all very lively) to have a cappuccino and check out the guide book for what to do tomorrow. They had live music and the girl singing was pretty good in the beginning but later I was wishing she would stop. I walked back and got to bed at 3:15 AM.